By the 3rd century BCE, Egypt had already gained an international reputation as the source for wisdom and learning. Pilgrims from across the ancient Mediterranean traveled to Egypt to study ancient texts in its schools and temples. This fascination has continued until the present day and it has been formalized by the academic discipline of Egyptology. In Hieroglyphica: A History of Egyptology, students will explore the history of Egyptomania by tracing its origins in the ancient world to the modern scholars of today through readings, lectures, and discussions. This course is a hybrid course with onsite and online components. Onsite classroom lectures and discussions will be recorded and uploaded for viewing through the online Canvas course. This course is a hybrid course and has simultaneous online and on-site sections. 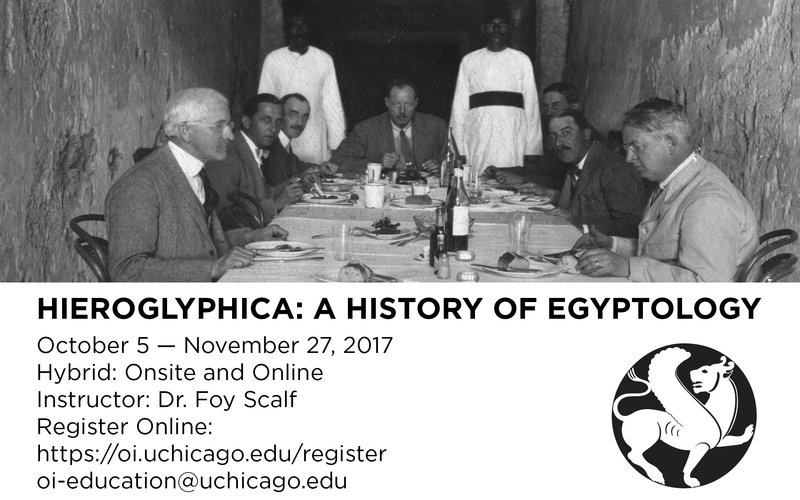 On-site class: This course will run for eight weeks every Thursday from October 5 to November 30 (no class on Thanksgiving Day) at 5:30-7:30pm at the Oriental Institute Room 210. For more information, contact oi-education@uchicago.edu.